Kevin has rapidly built a reputation as one of the UK’s finest keyboard exponents. Such is the extent of his musicianship that he is equally at home on the modern electronic instruments as well as the more traditional pipe organ and piano. Kevin was born in Barnsley, South Yorkshire in 1972 and had shown an interest in all matters of a musical nature at an early age. However, it was not until the age of twelve that he began to learn the electronic organ as his chosen instrument. At the age of sixteen, Kevin began to take an interest in the sound of the mighty theatre organ and it was a natural musical progression that he should begin to study this type of instrument, for which he developed a different playing style from that of his electronic organ performances. It was not long after this that Kevin began performing concerts throughout the country, featuring both electronic and theatre organs. In addition to his concert appearances and providing music in strict tempo for ballroom dancing, Kevin decided to continue his musical education and studied at a performing arts college before furthering his skills at Leeds University where, in 1994, he graduated with a Bachelor of Arts (Hons.) degree in music. Since graduating from University, Kevin has performed at many UK venues. 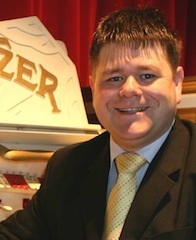 A highlights in Kevin’s career came in 1997 when he was chosen to be the new resident organist at the North Pier, Blackpool. In this prestigious position he has entertained thousands of holiday-makers in a town that has a long tradition in presenting the very best in organ music. His duties in Blackpool also saw him at the console of the famous Wurlitzer organ in the Tower Ballroom, in addition to his performances at the North Pier. Kevin is heavily involved with the 4 manual Compton that once graced Birmingham’s Paramount/Odeon Cinema. This instrument is currently installed in the Penistone Paramount theatre in South Yorkshire, where it is used on a regular basis for film and concert events.